Call me old-fashioned but I am yet to accept books in electronic version (now called e-books). For me, reading a book is about the whole experience rather than consuming the content. The touch and feel of the book in my hand makes a significant contribution to the pleasurable experience book reading is. So, the discussion shall not even remotely discuss any parallelisms with e-books. The love of physical books being established, it is no wonder that buying a book is one part of the overall experience. Landmark has been and continues to be my preferred bookstore for a lot of reasons or rather the lack of too many bookstores. However, I am also a huge proponent of E-commerce and the sudden surge in online book selling portals has made book buying easier to say the least. One critical differentiator that these online book stores offer is a hefty discount on the marked price which often tilts the scale in their favor. Why should one buy a book from say a Landmark then? But then people still do…. Infact, I have seldom come out of the store empty handed. According to me , there are some key attributes which kind of force me to buy a book anytime you visit a book store. Lets see if the same attributes can make a positive impact should one apply them to online book stores.. This is one aspect that is near impossible to replicate. There are times when one does not intend to make a book purchase but is in the vicinity of a book store. To kill time or just for the heck of it, a chance visit happens and once you are in, the books take over. So even if you did not intend to buy a book, chances are that you will find something worth reading even while casually browsing through. This approach again is questionable given the technicalities involved but still worth discussing. It is near impossible to replicate the touch and feel of the book in an online bookstore but then can’t the customer be allowed to flip through a few pages. One might say that there are excerpts given for every book but how about a hoverlet on book images which on a mouse over or click highlights the book cover and allows me to flip through the first few pages. Now, that is bound to have me hooked and I might purchase an additional book I never intended to. But I am not sure of the viability of the approach given the copyright laws et all..
To a certain extent most of the book stores do it in the form of “Related Books” section which highlights some other books either by same author or genre. However, the recommendations are mostly at the end of the page (below the fold) where the visibility factor is reduced. 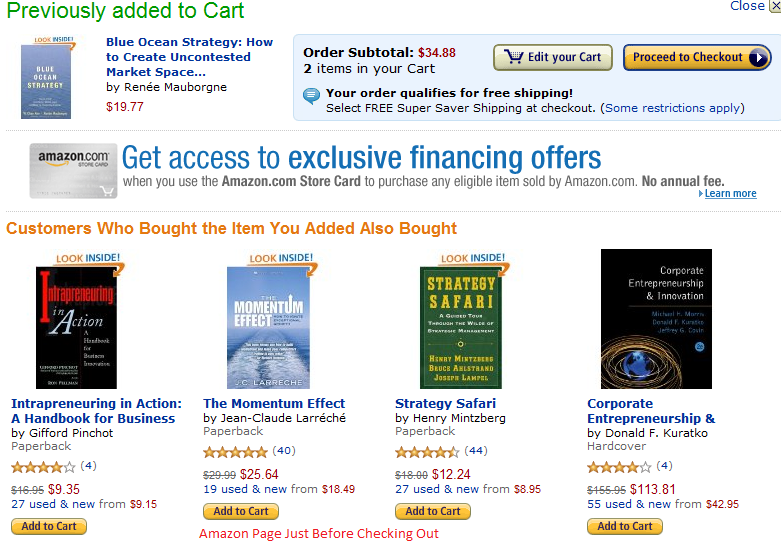 Amazon displays me a list of book that other customers bought along with the book I want to buy. The choices here are personalized to your interest tempting you to atleast explore the titles recommended to you. So, like brick and mortar book shop, Amazon does a very good job at ensuring that books never leave your eyesight. Even though it does not guarantee that I will always buy the recommended books but then there is no harm trying. I do not have the facts to justify the thought process but my guess is that it does help in deeper sales. For comparison, I took Flipkart as a reference but similar story exists at Indiaplaza and the likes. The page just before the final checkout shows me just the book I have selected. Neat and clutter free, yes, but then if you don’t show me any related options, you have taken other books out of my sight. The post basically came as a result of my recent visit to Landmark. Flipkart has become my favorite place to buy books for obvious reasons, but then all it took was one visit to a store to realize the value of other factors in influencing my buying behavior. What are your thoughts on the validity of the mapping of brick and mortar book shop attributes to the online bookstore. Are they too unrealistic or not with enough merit to drive the sales higher? Foreigners see India as 2nd most preferred destination for investment – What about Indians? Spammers, Beware: Sharing Customers Email IDs Will Be Punishable Offense, Very Soon! There are lot of benefits in online shopping for consumers to get a variety of services and items for 24X7 without having to move physically and also helped in time saving. Nice write-up…i strongly believe that onset of sites like flipkart has put us away from visiting a brick and mortar book store for buying the books we want. It is also interesting a fact that these online book stores offer unbelievable discounts which can not even be though of of at a standard book shop. For example i just saw this ad of a new e commerce website tradus.in these guys had taken a full page on HT city and were offering flat 50% off on authors like raghav bahl, paulo coelho amongst other…and what was more unbelieveable was the same day delivery promise in delhi. I never visited Landmark or shopped at the online book stores. What attracted me to read the article is the ‘habit of reading books’ itself. Also I would like to mention here that the habit of book reading is dieing. I have observed that none of my present job aquientences or business aquientences have a habit of reading books. (May be I am in bad company or really the habit is dieing, I dont know) So I thought of putting my feelings here. In small towns the source of books is a street where you find second hand book stores (the store keeper himself do not know the value of the book, he simply sells gems and trash at same fixed prices) I used to buy books from here. One negetive about reading a book by holding it physically in hand is the pain one feels in wrists :) I am not complaining but its a fond memory. But I know even holding a book in hand and flipping pages using fingers is an art. Recently one of my friends copies few books to my EHD (external hard drive). Most of it is trash. However few authors have merit. So after a gap of almost 15 years I started reading books in e-format, which is a different experiance compared to holding a book in hand. In college, it used to be a topic of discussion among friends while squatting in canteens. So like minded friends used to exchange books and references to books. I request Ankit to refer me to few books (I dont know what my interests are but I prefer books which improve GK). I can send you books of an author Arther C Clarke (writes about space, future times etc) I have in e-format (word format to be specific) and also ‘My War’ by Adolf Hitler. Based on my own usage of the website, i mostly use it when i have a specific book i want to buy and the discovery/impulse buying does not happen but its opposite while visiting a offline bookstore.